The differences in the before and after photos are subtle, so look carefully! 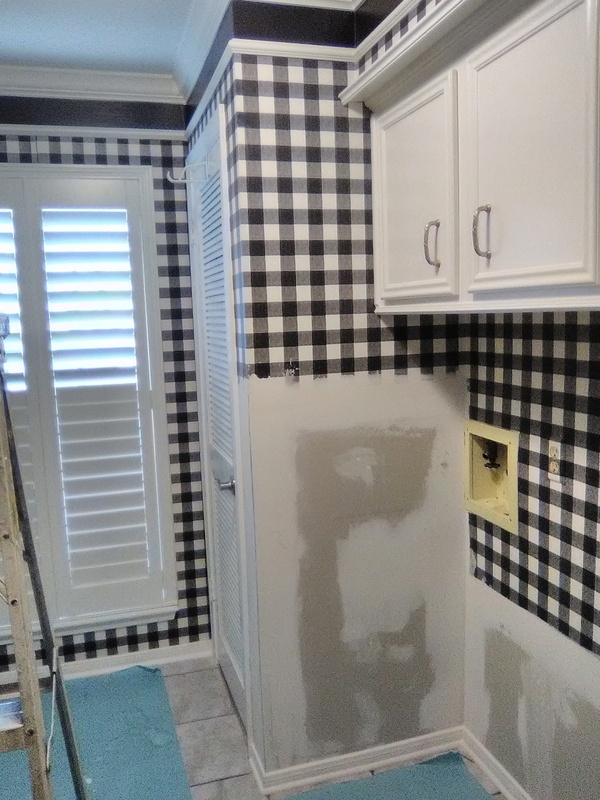 This laundry room in a far-north neighborhood of Houston (Louetta & I-45 area) happily sported it’s black & white checkered pattern for many years. 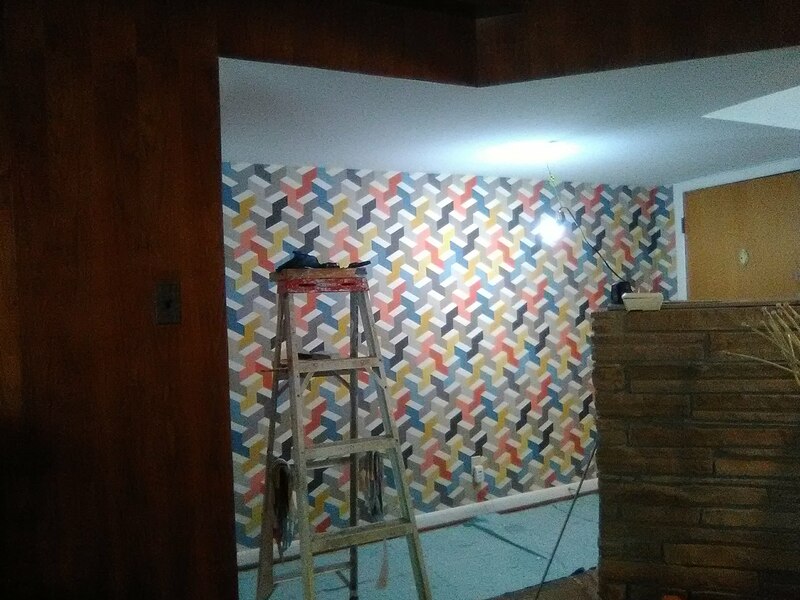 The wallpaper dated to the ’90’s, but still looked fresh, and the homeowner loved it. But an unfortunate water leak caused damage to the window wall, and a poor repair job left a very visible pattern mis-match over the window. 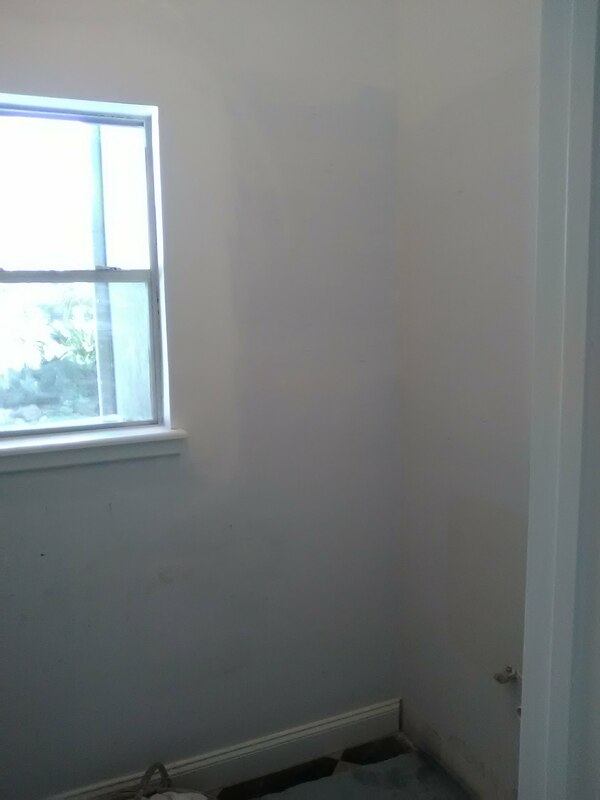 Then another water leak required new drywall to be patched in behind the washer and dryer (see top photo). So once the repairs were made, the homeowner wanted to redo the room, and do a little updating along the way. 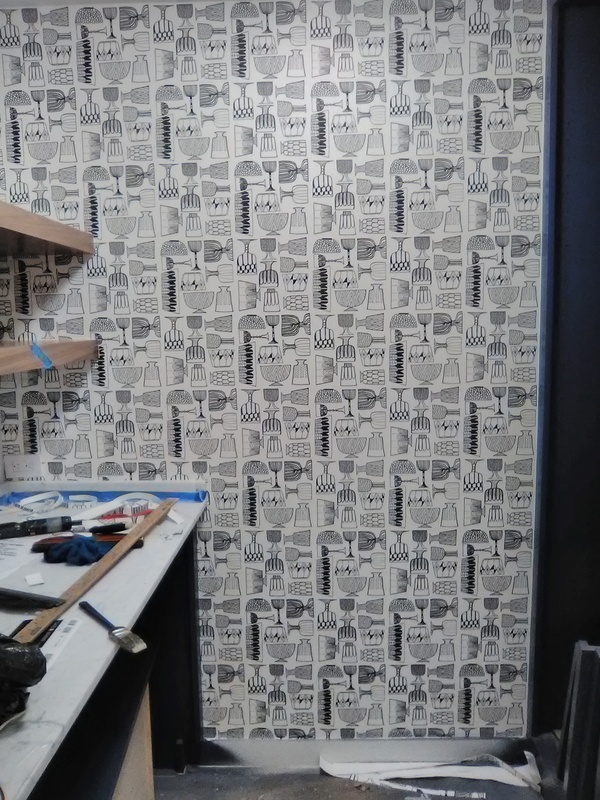 I stripped the old wallpaper, performed necessary patching and prep, primed the walls with Roman’s Ultra Prime Pro 977 wallcovering primer, and came back the next day to hang the new paper. It’s also a freer design – meaning that the wavy edges of the vertical and horizontal pattern, along with the watercolor features of the ink, afforded me some breathing room while dealing with walls and ceiling that were not perfectly plumb and level. This pattern is in the Magnolia Home collection (Joanna Gaines) by York Wall. 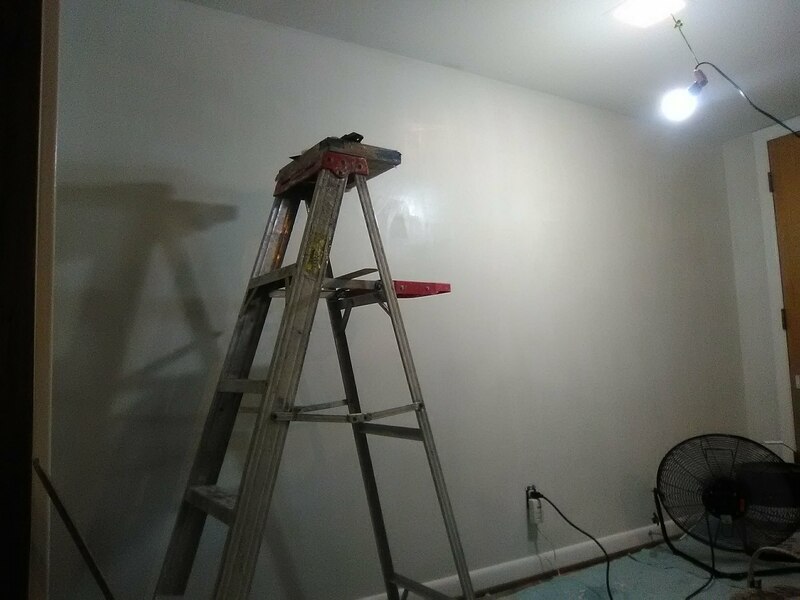 It was bought from my favorite source for good quality, product knowledge, expert service, and competitive price – Dorota Hartwig at Southwestern Paint on Bissonnet near Kirby. (713) 520-6262 or dorotasouthwestern@hotmail.com. She is great at helping you find just the perfect paper! Discuss your project and make an appointment before heading over to see her. 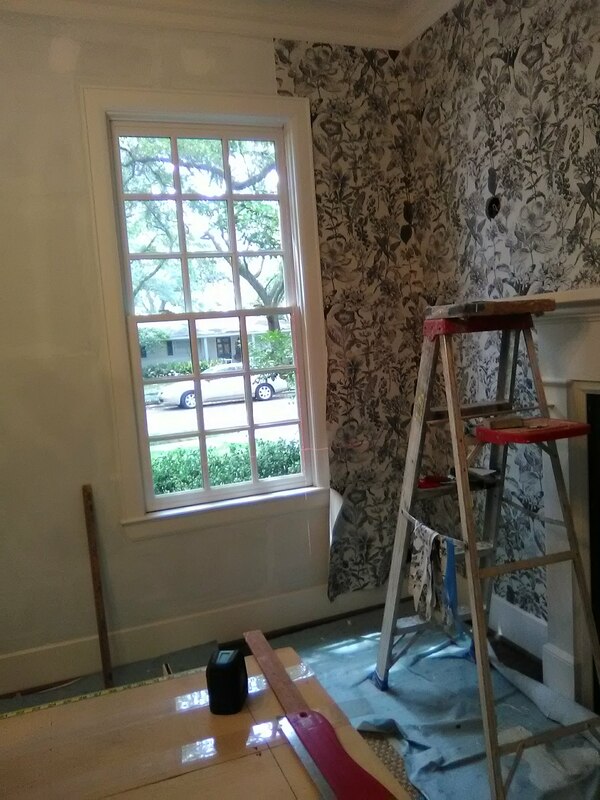 Coming around a window can be tricky, because wallpaper likes to twist out of shape, windows can be off-plumb and / or not square, and other reasons, so it’s possible that the pattern can match above but not under the window, or the edges above and below the windows might not line up. Or everything can start going off-plumb. In the first photo, you can (barely) see the vertical line of my laser level, which is helping me keep the left edges of the wallpaper strip lined up as the paper hangs over and then under the window. Next I hung the shorter strips above and under the window. I kept them “open” (did not trim the tops and bottoms), so I could “tweak” them if necessary. In the second photo, I have positioned the next strip, again using my laser level to create a straight, plumb line on the left edge. 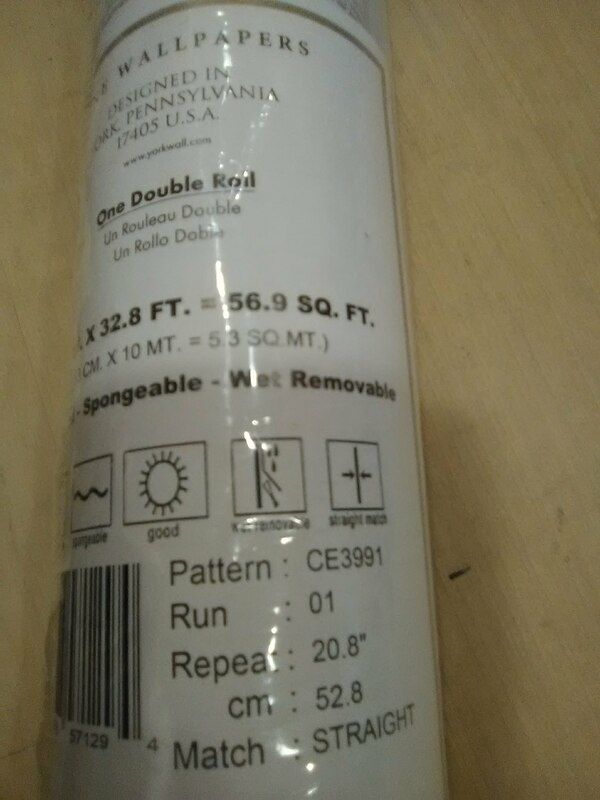 This will ensure that subsequent strips will also hang plumb. 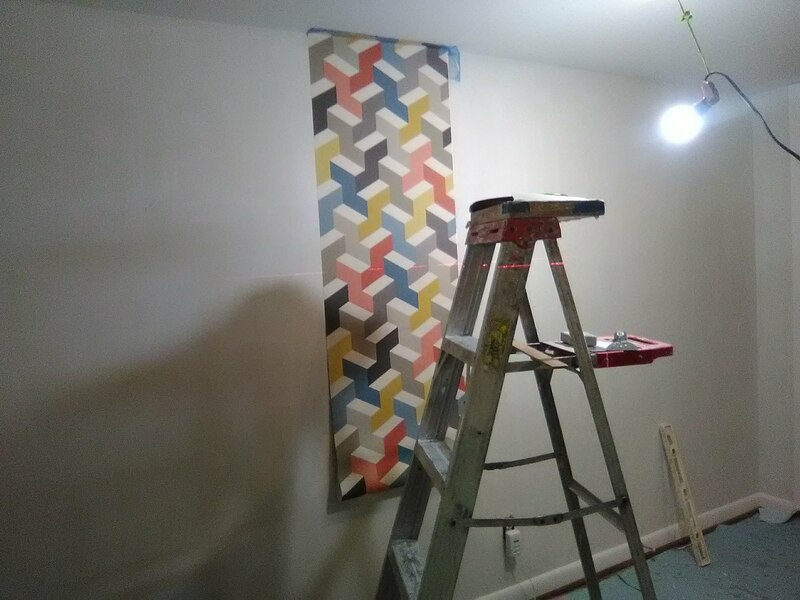 I let this new strip hang a bit below the pattern match of the previous strip, so I could accommodate any rise or fall in the pattern; the section under the window was longer, so this is the area I wanted the best pattern match. 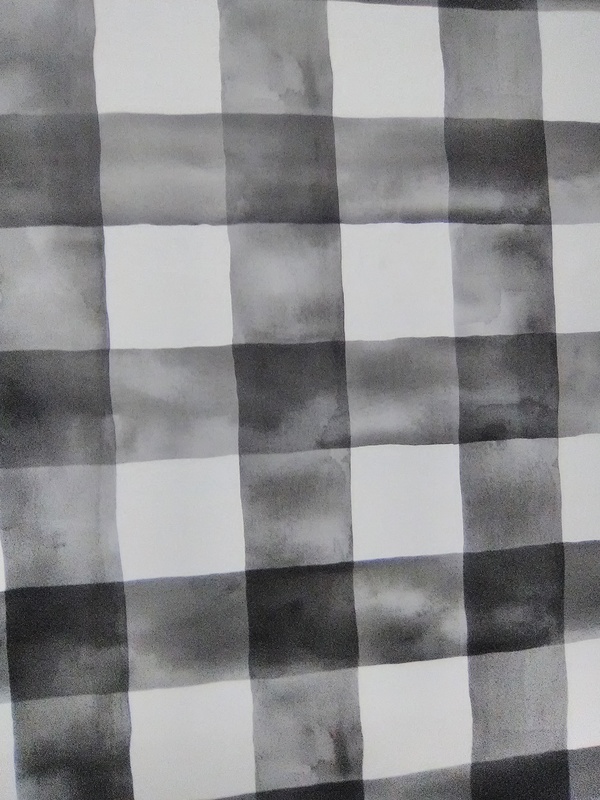 By leaving the paper loose, I was able to match the pattern at the under the window, then pull the paper up to meet the strip over the window. 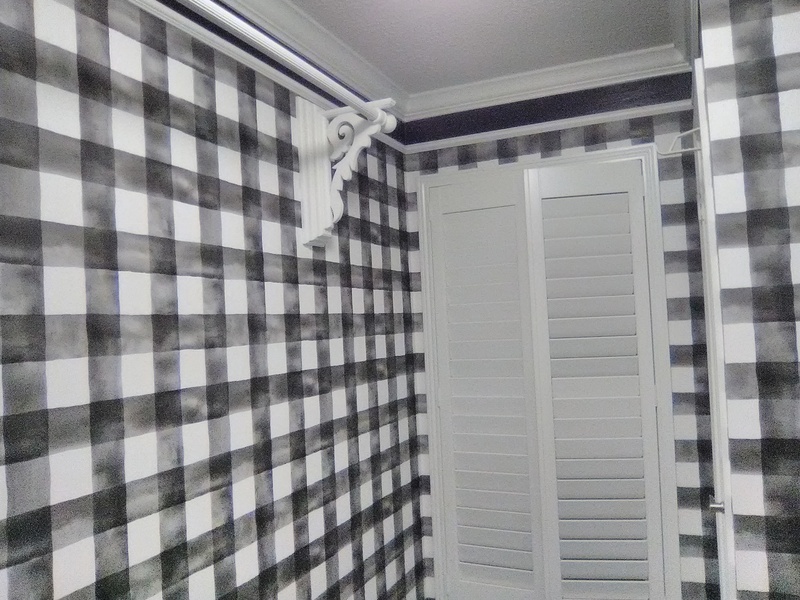 Sure enough, the pattern match was off a bit above the window. In addition, the strip on the top reached about 1/2″ further to the left than the strip under the window. This meant I was going to have a pattern mis-match, as well as an overlapped seam. But because I had not yet trimmed the top or bottom of that strip above the window, I was able to manipulate this strip to avoid these issues. I took this strip and cut it vertically along a flower stem. The right half I aligned with the pattern match on the right. The left half was moved down to match the pattern on the full-length strip on the left, while also butting it up against this strip. This meant that I had a slight pattern mis-match in the middle of the cut strip, as well as an overlap. All this was OK with me. The busy pattern easily disguised the slight pattern mis-match, as well as that 1/2″ overlap. In addition, it was way up high, over the window. 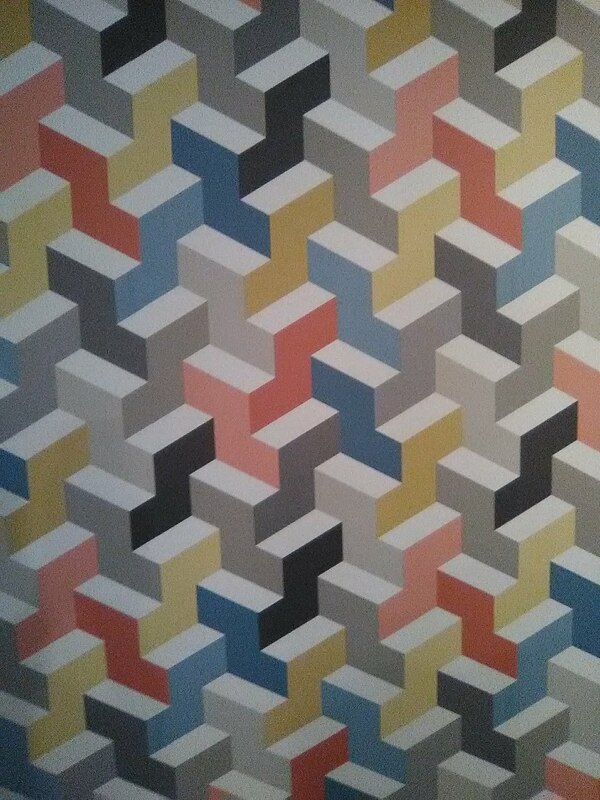 Standing back, you cannot notice any pattern mismatch or overlap. 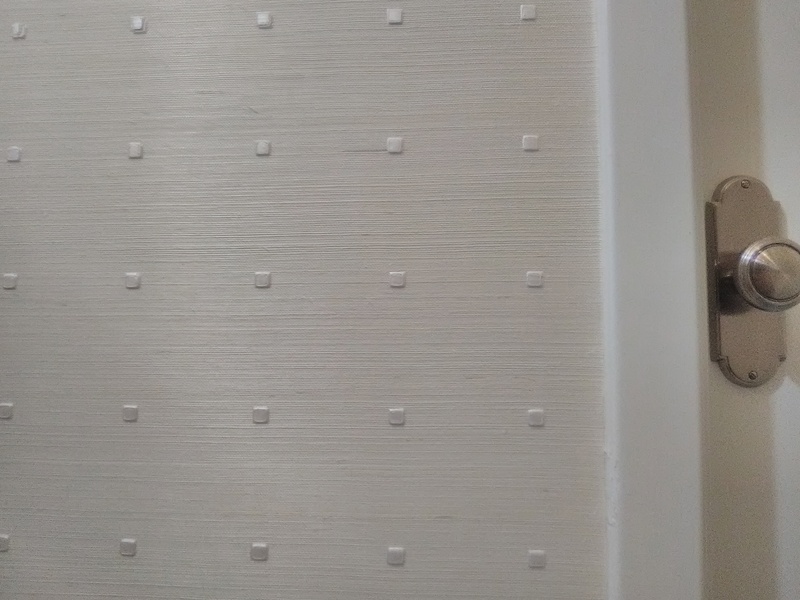 But what you do see is that the pattern runs perfectly across the top of the wall, and the subsequent strips are all and plumb and nicely butted together. See that narrow 3/8″ wide strip of wallpaper sitting on my table? That is to be my first piece coming out of this corner. 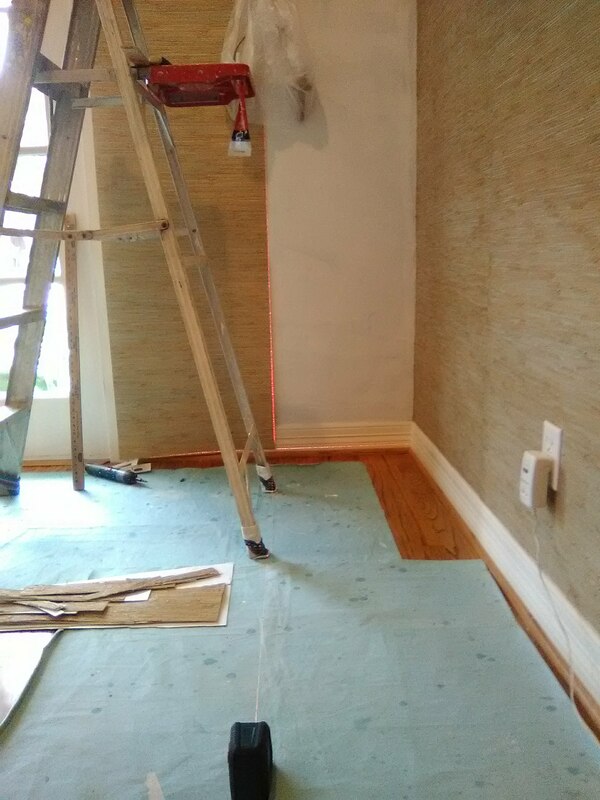 When you hang wallpaper around an inside corner, you don’t wrap it around the turn, but, rather, split the piece vertically so it wraps 1/16″ around the corner. Then the strip that you cut off is hung on the next wall, butted up into the corner. This avoids twists and wrinkles and bubbled areas caused by walls and corners that are not perfectly straight or plumb. 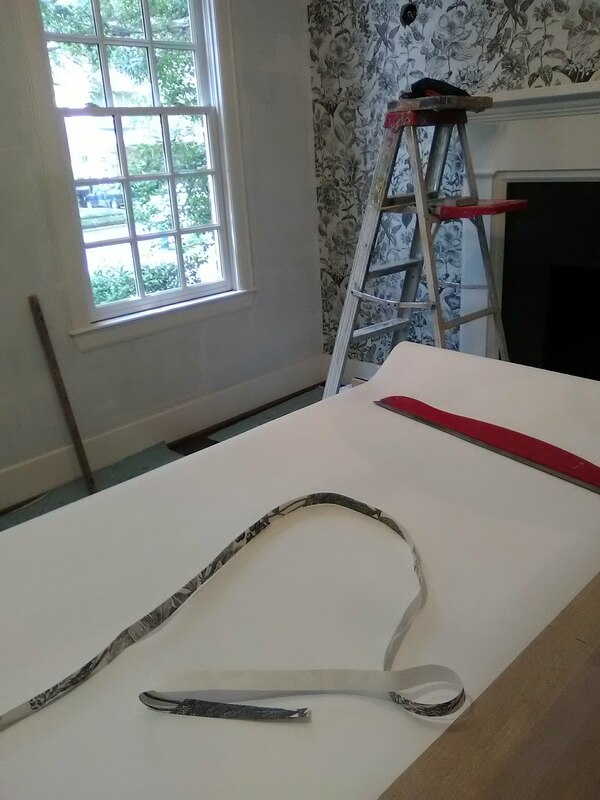 But when the piece that is to be the first strip on the new wall is this narrow, it presents problems, because it’s very likely to not hang straight, and you can’t hang the next strip of wallpaper against a crooked edge because you will get gaps and overlaps. Adding to the dilemma is that this narrow strip had already been pasted. I had finished for the day, and intended to hang the window wall to the left the next day. 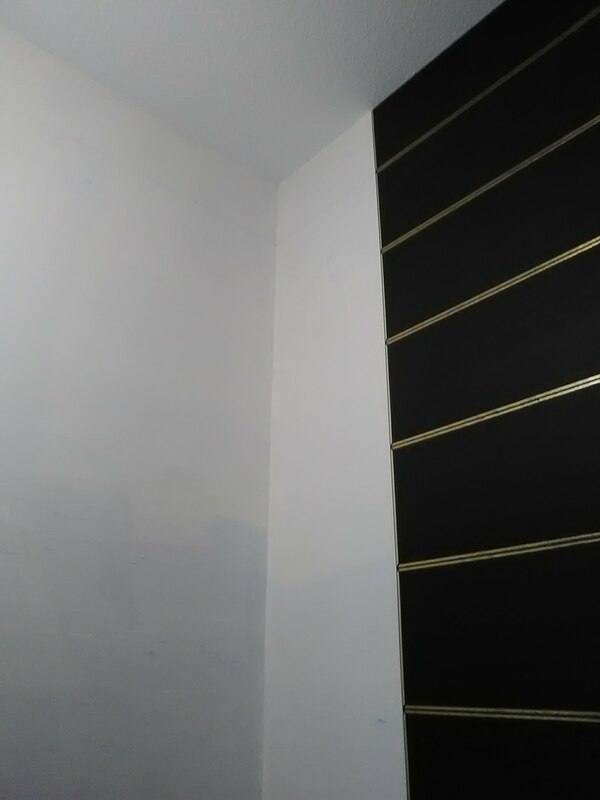 The strip was already pasted, but I couldn’t hang it because of the aforementioned issues, plus, you are supposed to hang a whole wall at a time, because all of the strips have to “meld” together – you can’t hang a wet piece against a dry piece. 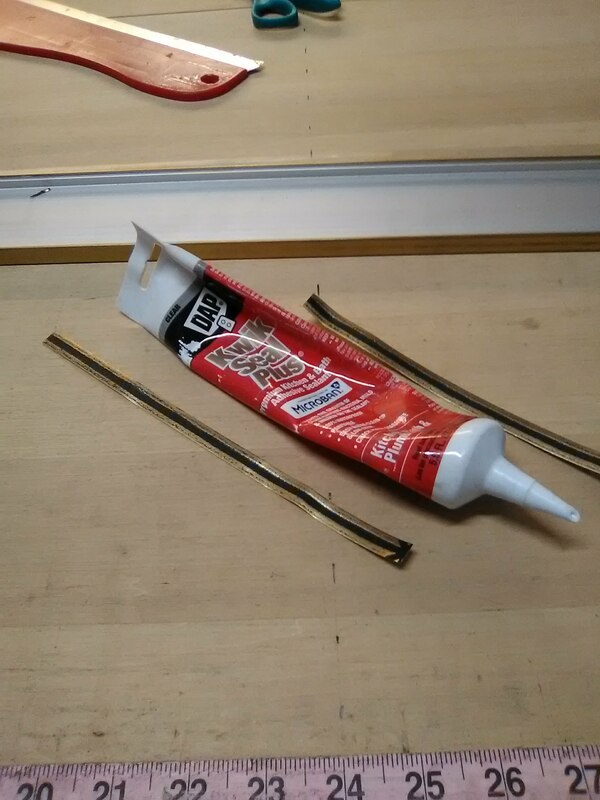 My solution was to wash the paste off this narrow strip, and hang it up to dry overnight. I just had to hope that the water would not cause it to expand too much, or warp, or other. The next day, I pasted this narrow 3/8″ wide strip, along with the strip that would be placed next to it. Then I hung them together, as if they were all one piece of wallpaper. That way, I could work them into the corner snugly, and keep the seam between them nice and tight. 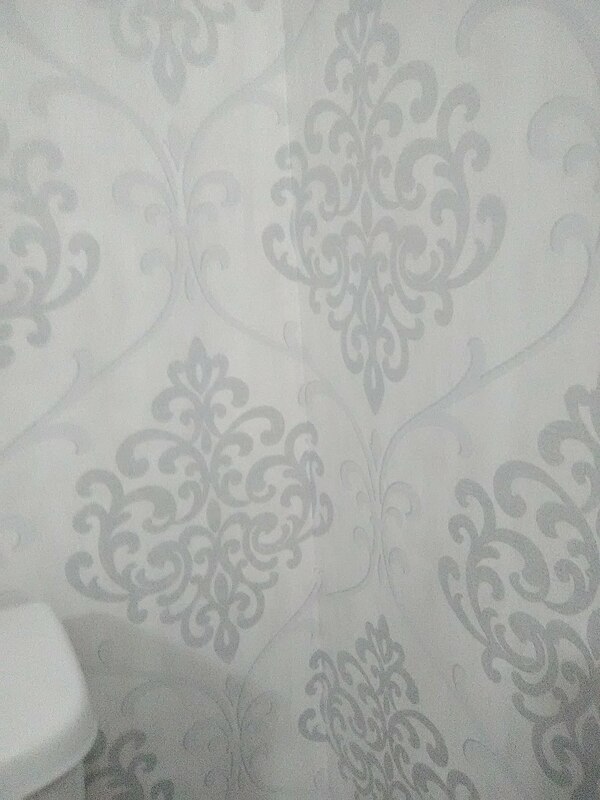 When coming out of corners, it’s common for the wallpaper to go off-plumb, because the corner might be out of wack. So you can (barely) see the red line of my laser level on the left edge of the strip of wallpaper, ensuring that the new strip falls plumb. This couple scored a cool, mint-condition authentic Mid-Century Modern home in the Reliant Stadium / Medical Center area of Houston. They have some wonderful authentic period furnishings, and wanted to add a little “pop” as an accent, but not so much as to overwhelm the home. 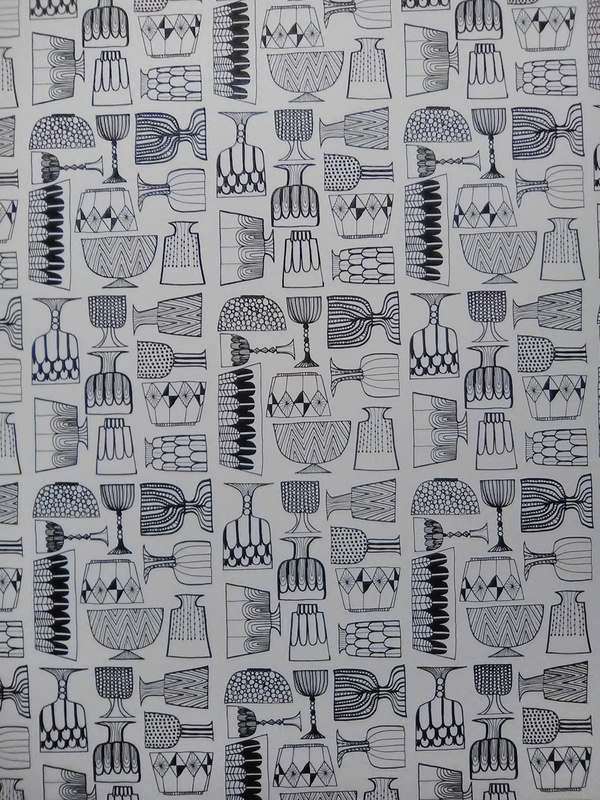 Well, you’ve gotta admit – this pattern really delivers! This design is in the feel of the artist MC Escher, who bent minds back in in the Art Deco and Modern periods (’20’s-’50’s) with his “never ending stairways” type drawings. 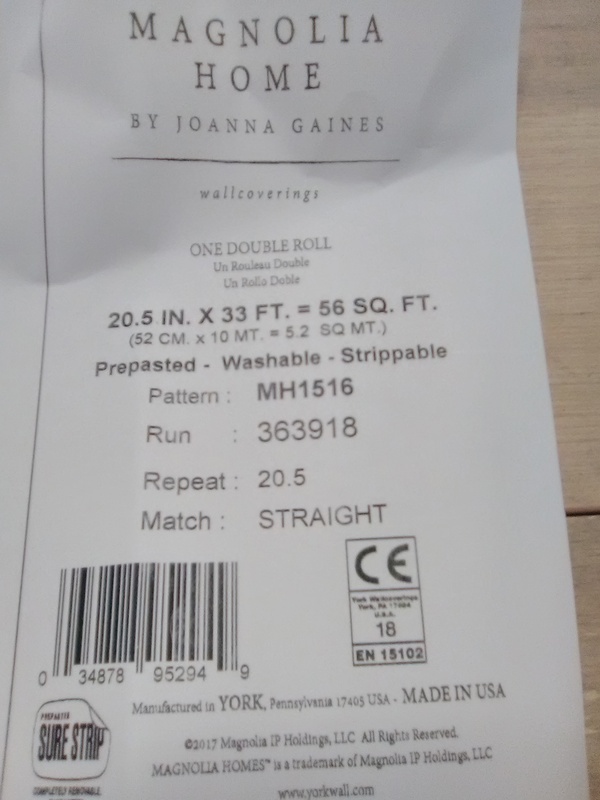 It’s by York, and is a non-woven material, and can be installed by either paste-the-wall or paste-the-paper (I prefer the paste-the-paper method). 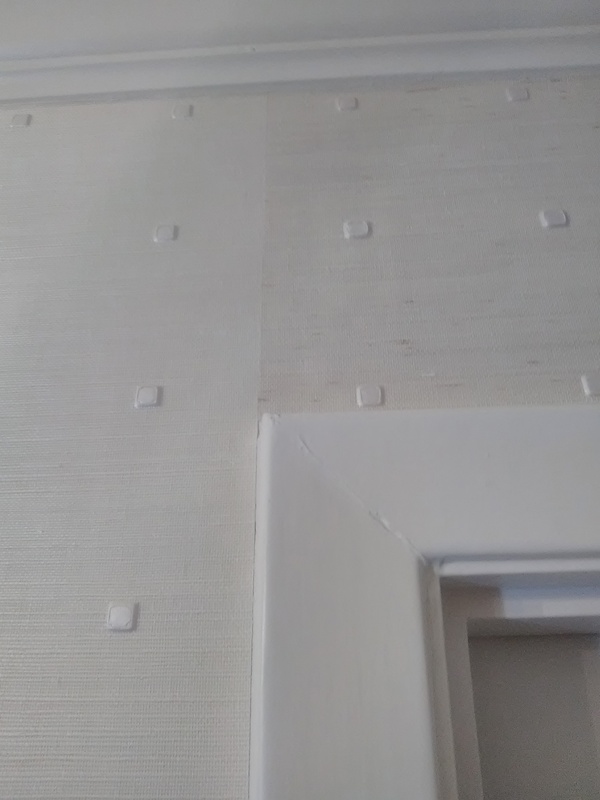 It is dimensionally-stable (doesn’t expand when it gets wet with paste), and is designed to strip off the wall easily when it’s time to redecorate. 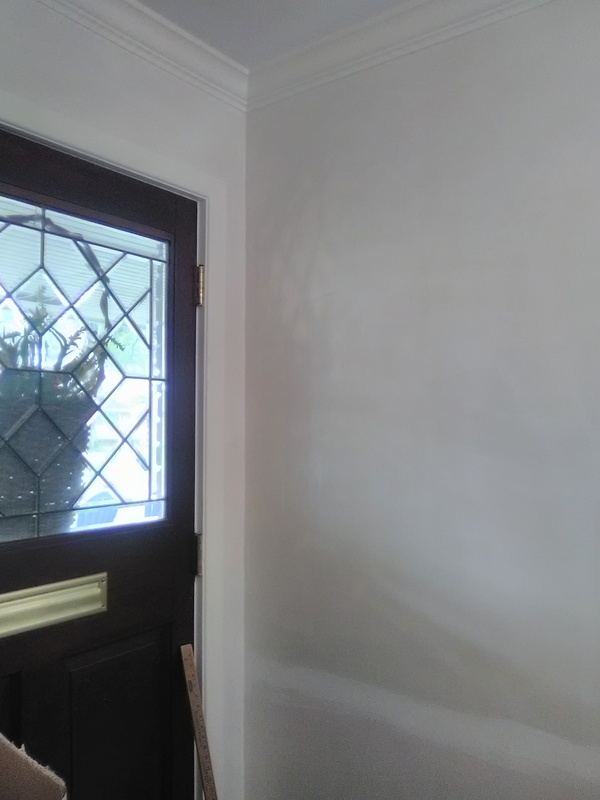 The ceiling in this entryway was way off-level, so I knew that the motif I placed at the top of the wall would start going off-track as it moved across the wall. So I started in the middle of the wall, so that any pattern distortion would be visually lessened by being split across the width of the wall evenly from the center. In the second photo, I’m using my laser level to get a plumb starting point for my first strip. The blue you see at the top of the second photo is plastic tape I use to keep paste off the ceiling. It can be used around woodwork and other surfaces, too. You can also see how the bottom section of the strip of paper is “booked” (folded back on itself). 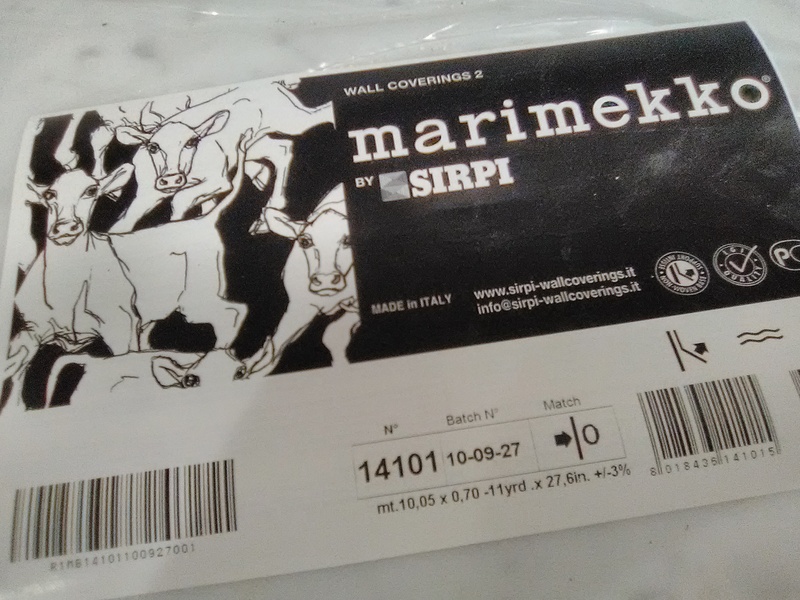 This shortens the strip of paper, thus making it easier to handle, and also keeps the pasted side from bumping against the wall, which could cause paste stains and also make the paper stick to the wall where I don’t want it to. 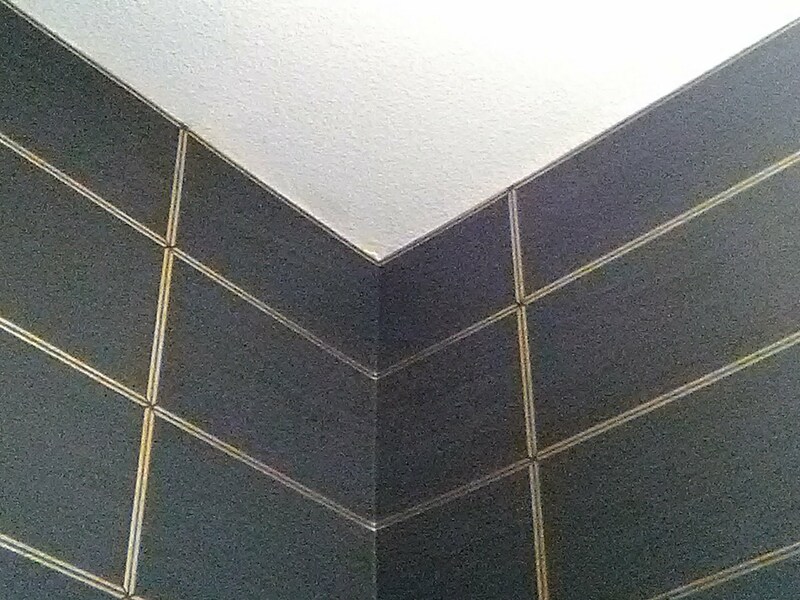 Because walls are never plumb, and because ceiling lines are never perfectly level, and because wallpaper can twist and distort once it gets wet with paste, with a pattern like in the previous post, it’s not advisable to place a key element, such as the gold horizontal line, at the top of the wall. It will begin to run crooked – either up into the ceiling, or fall down below it. So for this install, I raised the pattern so that the horizontal gold line would be cut off. This made that top block about 3/4″ shorter than the blocks below it. Not a biggie – at 10′ up, no one is going to notice this small discrepancy. I did want to make the blocks look more homogenous, though. I thought that having a gold frame around all sides of the top blocks would make them blend in better with the other blocks all around the room. So I used my straightedge to trim some narrow strips of the gold double-stripe out of left over wallpaper scrapes. Then I appliquéd them on top of the paper, just at the ceiling line. This 30-year old home was flooded last August during Hurricane Harvey, and today is just a couple of weeks from being finished with the rebuild. 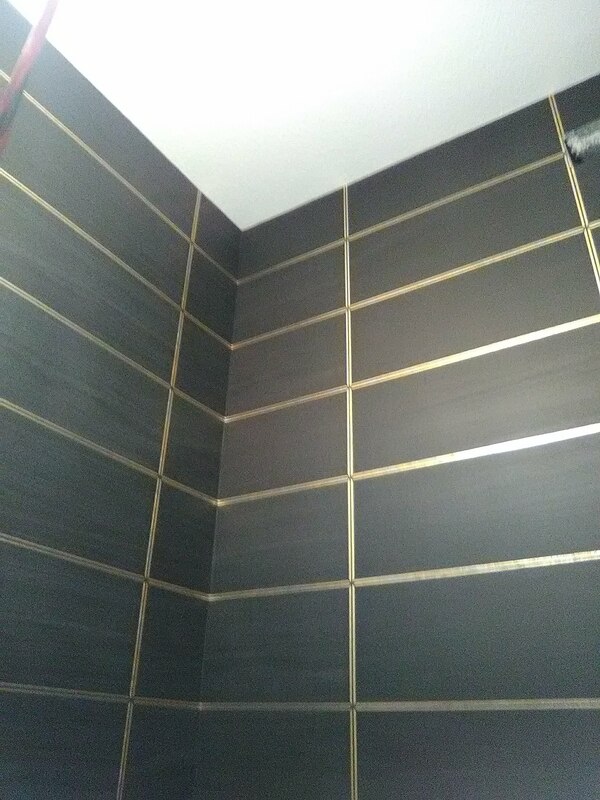 This gold-on-black stacked-block pattern was chosen to help bring a more contemporary look to the home, as well as pump up the drama factor – a stunning gold-on-black console-style vanity and a huge, jaw-dropping crystal chandelier will be installed next week. I hope they send me photos! Keeping this very rigid pattern plumb and level was a bit of a challenge, especially since all the walls were out of plumb. At the top of the second photo you see my horizontal line marking where I wanted the top gold line to fall. This line helped me keep the pattern perfectly aligned all the way around the room. 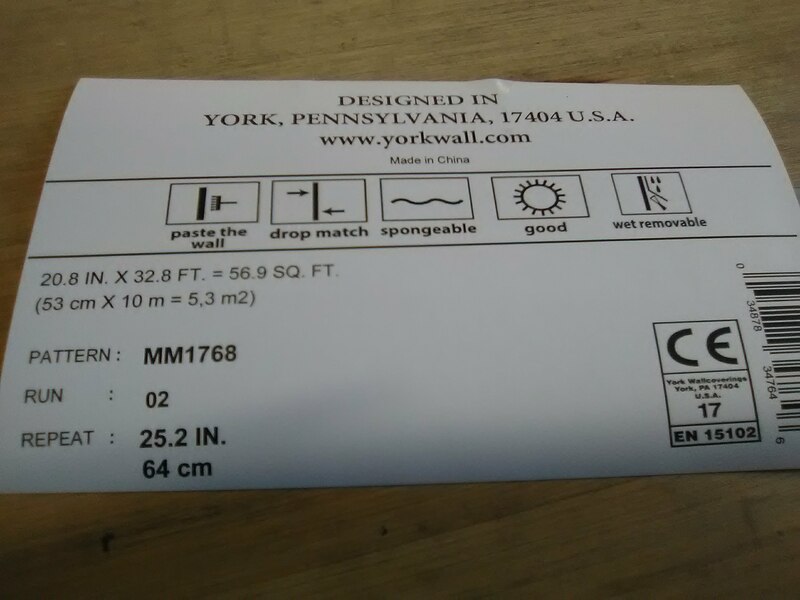 This paper is by York Wall, in their Sure Strip line. It is a non-woven material, but is thin and soft and pliable, and was a delight to work with. 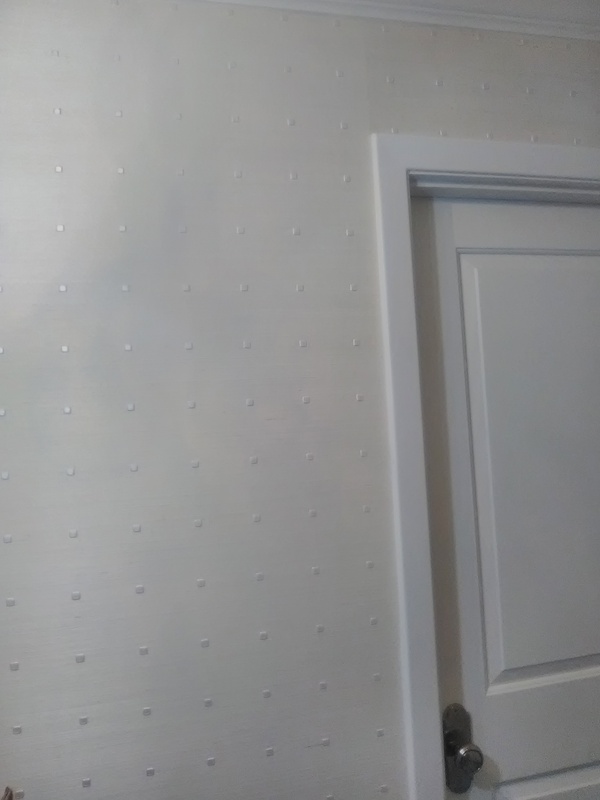 You could paste the wall to install, but I chose to paste the paper, because it makes the material more flexible and easier to work with and easier to keep clean. I wouldn’t mind hanging this product every day! 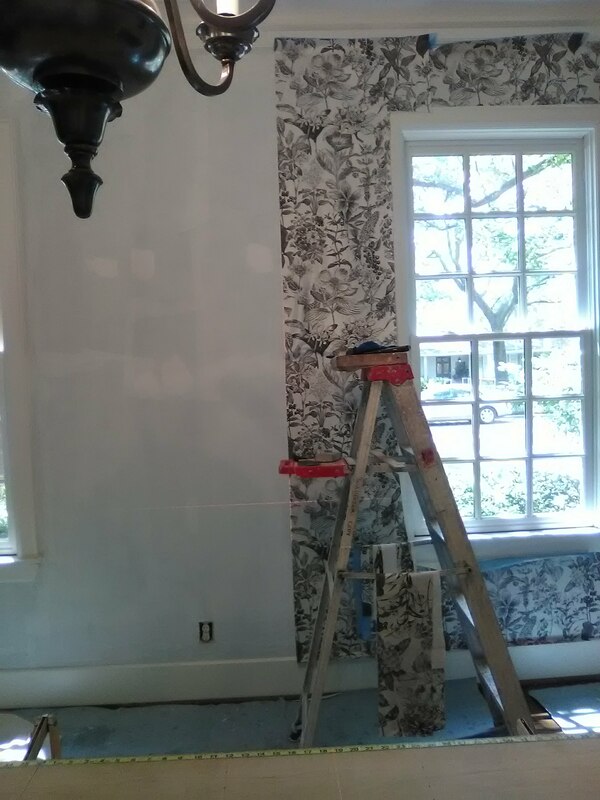 The wallpaper was bought from my favorite source for good quality, product knowledge, expert service, and competitive price – Dorota Hartwig at Southwestern Paint on Bissonnet near Kirby. (713) 520-6262 or dorotasouthwestern@hotmail.com. She is great at helping you find just the perfect paper! Discuss your project and make an appointment before heading over to see her. The interior designer for this home is Wes Satterwhite, of Silver Oak Consulting, here in Houston. 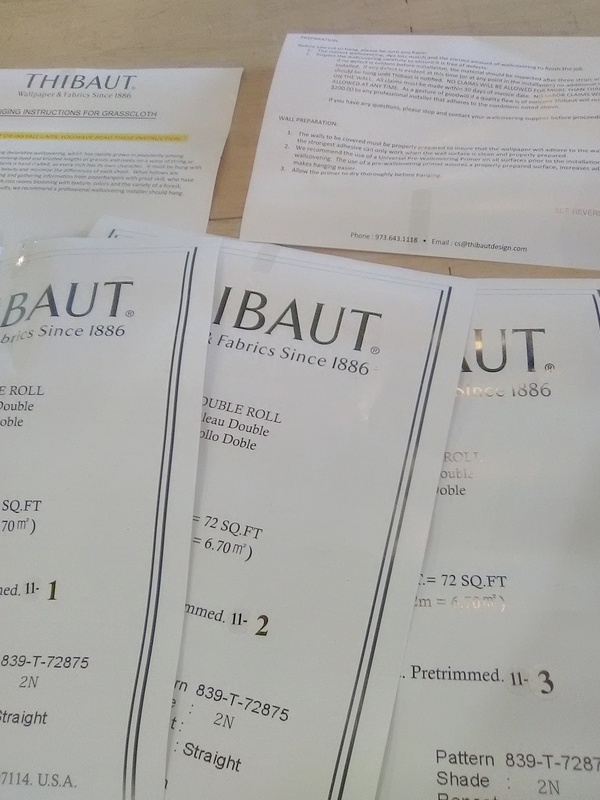 He’s been overseeing much of the selections of finishes, paint colors, hardware, cabinets, flooring, drapes, etc., from the very beginning. Re my previous posts, here I am using my laser level to help get the seam aligned with the light sconce, as well as ensure that it hangs level. The laser level is the small dark object in the lower center of the photo. 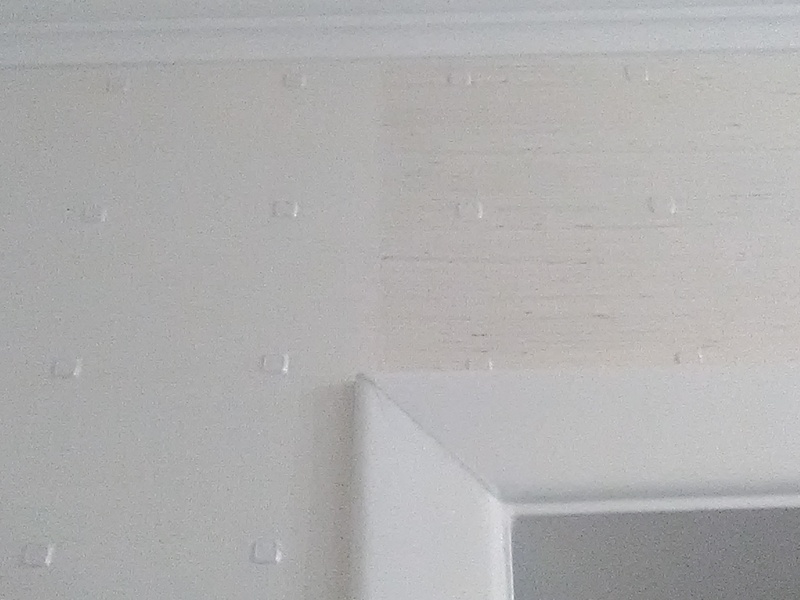 When wallpaper turns an inside corner, you split the strip vertically and place the first half of the strip so that just a teeny tad wraps around the corner, and then you overlap the remaining strip into the corner, using a level to plumb this strip. This keeps all your subsequent strips nice and plumb, and running straight at the ceiling and floor lines (assuming that these lines are truly level). 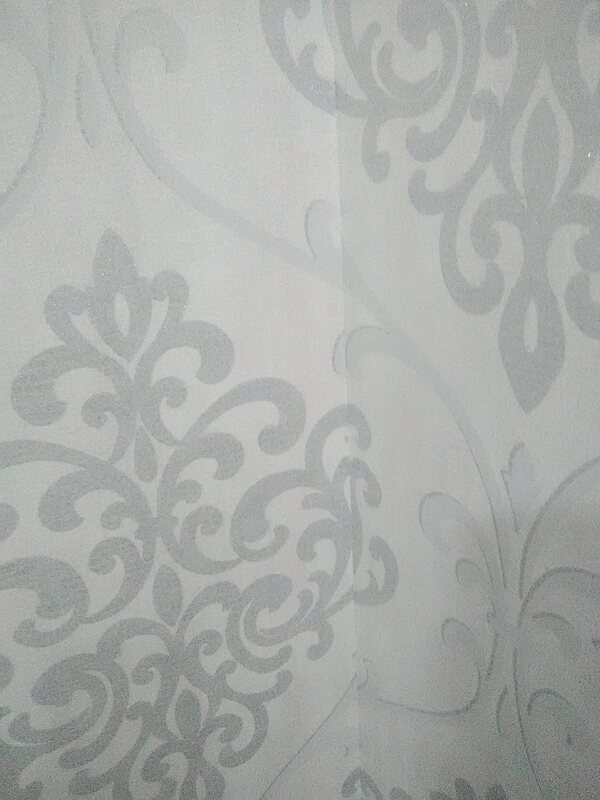 But when walls and corners aren’t plumb, wallpaper patterns will get distorted. The rule of thumb is to match the pattern at eye level, and then let it fall as it will above and below that point. This pattern is busy enough that the mis-match is not all that noticeable.